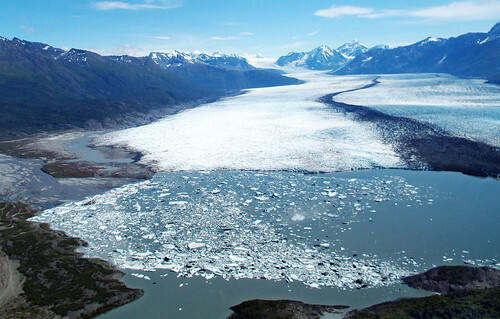 A melting glacier: indicative of global warming. It’s getting worse. CC-licensed photo by Len Radin on Flickr. A selection of 11 links for you. Not assigned any particular place in hell. I’m @charlesarthur on Twitter. Observations and links welcome. While this planet has seen hotter days in prehistoric times, and colder ones in the modern era, what sets recent warming apart in the sweep of geologic time is the relative suddenness of the rise in temperatures and its clear correlation with increasing levels of greenhouse gases like carbon dioxide and methane produced by human activity over the same period. The other day I was reading a depressing article about plastics being all through the marine food chain, and thought: this is the dinosaurs’ revenge. They got turned into oil, and now we burn them and wreck our ecosystem. A slow-motion meteor. Previous research showed that meltwater from Thwaites accounts for about 4% of the global sea level rise, said Ted Scambos, a senior research scientist at the National Snow and Ice Data Center in Boulder, Colorado, who was not involved with the new study. Worth declaring a state of emergency for the crisis on the US’s south-eastern sea border? Instacart, along with rival DoorDash, has been under fire in recent weeks from workers who say the tips added by customers on orders are being used to subsidize a minimum pay rate, instead of being used as bonuses. Meet the new boss class, same as the old boss class. Not only has Spotify acquired Gimlet Media, a podcast producer and network, for around $230m — a deal Recode told you about last week — but it has also bought Anchor, a startup that makes it easier for people to record and distribute their own podcasts. The company says it isn’t done — it says it has other podcast acquisitions in mind and that it expects to spend up to $500m on deals this year. Reminder: with these deals, Spotify is now fully in the content creation business, a move it has yet to make with music. In a blog post up this morning, Spotify CEO Daniel Ek says he didn’t plan on getting into podcasting when he founded the company 11 years ago, but he’s in it now. He says Spotify is now the world’s second-biggest podcast platform (behind Apple), and that podcast listening will eventually make up 20% of Spotify’s usage. Here’s why. Spotify struggles to be profitable because when playing licensed music, it has to pay a fixed amount per track. Two hours of music listening costs it twice as much, and the subscriber has only paid once. For ad-funded listening, Spotify can play twice as many ads, but they don’t monetise as well as a subscription. However: if someone listens to one hour, two hours of podcast – there’s no payout. The more time people spend listening to podcasts instead of music, the better Spotify’s margins get. Ideally, people would spend 100% of their time listening to lovely non-royalty-bearing podcasts. So buying podcast companies is an initially expensive method of aligning yourself with “listening” while improving your profitability, long-term. The draft ‘statutory instrument’, which has been tabled as part of a raft of no-deal preparations, means that from March 29 phone users will be liable for surcharges when they travel on the continent. In a note accompanying the secondary legislation – the Mobile Roaming (EU Exit) Regulations 2019 – government admits that consumer groups lobbied hard for a new scheme to maintain the current arrangements. But “after careful consideration, the government decided not to adopt this proposal”, it states. The Department of Culture, Media and Sport (DCMS) justified its stance by saying that if the current system continued after Brexit, UK phone firms would face “increased costs” from EU carriers that they might then pass on to customers. For American readers: charges for UK visitors to the continent used to be a ripoff. Then the EU forced carriers to zero-rate them across the EU. Now the UK’s going to repeal it (probably). we’re keenly aware of the risks this [speech generation] technology can pose if used with the intent to cause harm. Malicious actors may synthesize speech to try to fool voice authentication systems, or they may create forged audio recordings to defame public figures. Perhaps equally concerning, public awareness of “deep fakes” (audio or video clips generated by deep learning models) can be exploited to manipulate trust in media: as it becomes harder to distinguish real from tampered content, bad actors can more credibly claim that authentic data is fake. We’re taking action. When we launched the Google News Initiative last March, we committed to releasing datasets that would help advance state-of-the-art research on fake audio detection. Today, we’re delivering on that promise: Google AI and Google News Initiative have partnered to create a body of synthetic speech containing thousands of phrases spoken by our deep learning TTS models. These phrases are drawn from English newspaper articles, and are spoken by 68 synthetic “voices” covering a variety of regional accents. We’re making this dataset available to all participants in the independent, externally-run 2019 ASVspoof challenge. This open challenge invites researchers all over the globe to submit countermeasures against fake (or “spoofed”) speech, with the goal of making automatic speaker verification (ASV) systems more secure. By training models on both real and computer-generated speech, ASVspoof participants can develop systems that learn to distinguish between the two. The results will be announced in September at the 2019 Interspeech conference in Graz, Austria. Another arms race, or maybe speech (voice?) race. As a bidding war heated up among a handful of states, including Michigan and Ohio, Wisconsin upped its offer. Foxconn demanded subsidies that would make US operations as cheap as in China, and Hogan says Foxconn estimated a 30% cost difference. He acknowledges the subsidy numbers grew “staggering” but says Foxconn won’t get those incentives without delivering the promised numbers of jobs. …“There’s no way this will ever pay itself off,” says Tim Bartik, a senior economist at the W.E. Upjohn Institute for Employment Research. He says Foxconn’s incentives are more than 10 times greater than typical government aid packages of its stripe. “Weeks” isn’t enough time to change a system that will be deeply embedded, and airlines aren’t known for having the fastest-moving approach to changing their systems. I’m sure some readers would have more knowledge of this. Apple’s sleek, minimalist, glass-enshrined stores have long been holy places for Apple diehards, and expanded to 506 retail locations on five continents during Ahrendt’s tenure. As the former chief executive of Burberry, Ahrendts was expected to be the face of Apple, but instead quietly worked in the background, carefully choosing her media appearances and staying out of the spotlight most of the time at the company’s semi-annual press events. Ahrendts made her first on-stage appearance at Apple’s annual iPhone event in September 2017, where she called retail Apple’s “largest product” and shared how she envisioned the stores becoming “town squares” with plenty of green space, where people come together to hang out, learn new skills and, oh, buy the new $1,000 iPhone. In an effort to get people to think of Apple products as part of a lifestyle, Ahrendts also spearheaded free “Today at Apple” courses, which launched in 2017. Apple continues to launch new sessions, including coding classes, software lessons and walking tours, where people can learn how to use the Apple Watch for fitness or how to shoot cinematic photos. Apple said it has held more than 18,000 free sessions since the launch and has reached millions of people. During her tenure, Ahrendts also introduced more practical shopping functions that customers have come to expect from retailers, including the option to buy online and pick up in-store; and text message alerts, so people don’t have to linger waiting for an appointment at the Genius Bar. Hm. The stores were already well-liked (despite former Dixons chief John Browett’s brief, unlamented, efforts). It’s really hard to get any feel for what impact Ahrendts had. If anything, the stores now feel too sparse to me when I look inside them: where is the excitement about new products? The big excited posters? The tables crammed with other extras to buy? They feel more like service centres than shopping destinations, and I don’t think that’s positive. Her departure feels like she didn’t think she could make further impact. I couldn’t find any better analysis; nobody with contacts at this level will share the insights. …according to Nest, the likelihood is that dirtbags are trying out usernames and passwords dumped online from unrelated website security breaches, to access Nest accounts where credentials have been reused. As we have said before, Nest allows two-factor authentication, though presently only via SMS (which is weaker than TOTP – timed one-time password – systems such as Authy or Google Authenticator). Odd that a company which is part of Google shouldn’t have TOTP. As corporate mottos go, “Don’t be evil” is hard to beat. If your company’s ambitions are to change the world, having those little three words in the back of every employee’s mind is sure to lead to good outcomes – isn’t it? That’s why Google adopted it after a meeting about corporate values in 2000 or 2001 (the history is hazy), where it was suggested by Paul Buchheit, who also went on to create Gmail. “Don’t be evil!” Seriously, how hard can that be to follow? Yet, as the novelist Stephen King points out, nobody considers themselves the “bad guy”. People start with good intentions and then, somehow, bad things happen. That’s what has happened to the lofty goals of the big Silicon Valley companies. They started with a raw-ingredient mix of idealism, social networks, mobile phones and software. And we cooked it into a stew of partisanship, hate, abuse and even murder. Of course, you may well ask whether Big Tech had a soul in the first place. Regarding a slow moving meteor. In popular mythology the meteor wiped out the dinosaurs instantly. In fact (assuming I remember my history correctly), it was a much longer process last a few years, so from one perspective, its pretty similar to the timescale we’re looking at now (50-100 years). The other aspect with Ahrendts is that she talks about missing her kids in London, and as the article points out, she was paid pretty well. So from all accounts she wasn’t fired, but decided to move on. Tim Cook’s tweet about her leaving (and welcoming her replacement) is something he hasn’t done before for those who were let go, so it looks like they are parting amicably (John Lewis seems to be the closest to Apple in surviving with retail stores, and it all comes down to customer service). It’s not dead: https://www.androidheadlines.com/2019/02/google-glass-enterprise-edition-2-nrra-certification.html . Nice SoC too, I want that in my phone. Google is showing perseverance in the weirdest places. An OS update ? To fix one app’s bug ? Reminds me of those “Reformat hard drive, reinstall Windows” tech support jokes.On the Android side, it is https://www.slashgear.com/google-duo-now-available-worldwide-on-play-store-19452610/ . Boom, PlayStore download, install and updates. Modularity, people ! PS I know iOS does incremental/differential updates, they’re still OS updates, not app updates. I’m not even saying it’s a Bad Thing: that way “OS version” means all 1st-party apps are on the same page too. What I’m saying is that iPhoners assume OS updates mean the same thing for Androiders. They don’t, and Androiders can have the latest apps + features on very out-of-date OSes (5.0 is dandy for anything, 4.4 and 4.1 start tingle a bit), which takes a lot of the sting out of running an ancient version. Apple relies on system-wide frameworks for iOS more than Android seems to. In that sense the OS is more monolithic, so it seems that yes, updating FaceTime and its associated frameworks throughout the OS does require an OS-level update. Google Play updates are the same thing: updates of frameworks that the associated apps rely on. A discussion to be had perhaps about whether Apple should force those updates, as Google does. Not said is whether the whole page was truncated snippets, or if truncated snippets were intermingled with full ones, and if the overall volume of clicks in this second case also dived, or moved to full snippets. So maybe, just PR. Plus anyway, Google could probably pay a few tens of millions to news outfits to get rights to full snippets, if not full articles. Amusingly stupid: Google launches some type of encryption and calls it… **AD** something something (unpronounceable). Branding genius at work, twice over.